Bored with ordinary chess pieces? Want to make your chess game feel different? Or want to teach your children about chess game? Use this kind of different color chess! All of your problem with chess pieces will solved. If you feel bored with ordinary chess which are black and brown, you can change it with our color chess. This time we have dark brown chess pieces vs white-reddish chess pieces. Those chess pieces will change your imagination of chess. This color chess set is very beautiful and interesting for indoor and outdoor chess game. You can teach your kids using those interesting and colorful chess pieces. Sure that your children will learn fast about chess and enjoy the game. Just call us to order this wooden chess pieces. 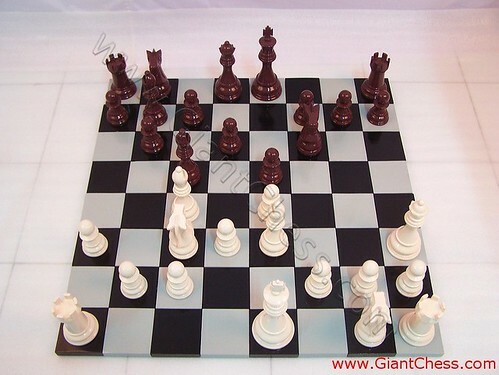 We offers the widest selection of wooden chess pieces and wooden giant chess to anywhere.